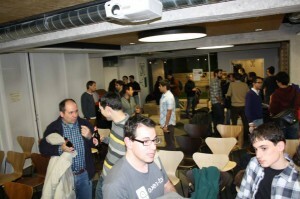 Last Wednesday the 22nd of January the 39th edition of the developers meeting Betabeers Madrid took place at IE’s Area 31. More than 80 developers participated and there was a great turnout of IE students. This was a great opportunity for students to learn from the startups who pitched their products and also to learn about strategies for hiring IT professionals. After the event participants enjoyed beers and took advantage of a great networking opportunity. This networking session was particularly useful for start up teams who are looking for a programmer, over 80 developers were in attendance. Betabeers is a monthly meeting for developers of web services, hardware and mobile apps.They hold technical talks, provide opportunities for local startups to introduce themselves and for networking. Their goal is to show startups that you do not need to be based in Silicon Valley to launch exciting projects. To learn more about Betabeers check out the video below. 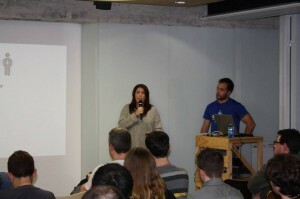 Gudog: Lola Garrido and Javier Cuevas presented their startup Gudog, a webpage that connects dog owners with experienced dog sitters, a service that can be very useful when you go on vacation and you do not have anyone to take care of your dog. 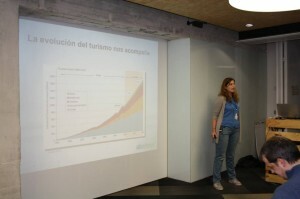 Alterkeys:Patricia González presented Alterkeys a web page for people who want to rent their home or apartment to travelers from around the world to make some extra money in a secure way. Dymotics: Miram Muros and Alex Martin presented Dymotics an app that lets you control different devices in your home from you mobile phone. They even demonstrated the product turning on and off the lights of IE’s Area 31.